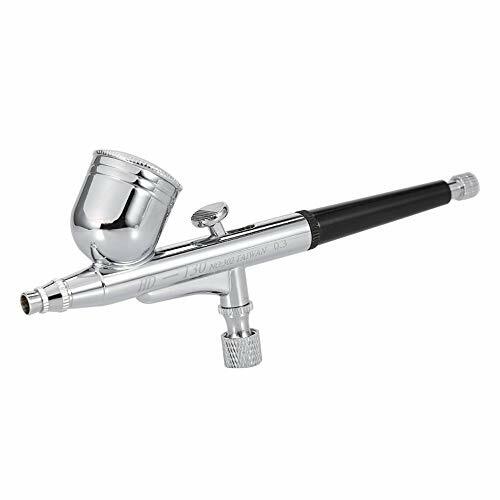 * Professional Precision Single-Action Gravity Feed Airbrush with a 0.4mm Tip & 1/16 oz Cup. Airbrush is designed to provide an ultra fine mist of makeup, allowing you to achieve a flawless, soft natural complexion. * Anti-Aging Moisturizing Primer (1/2 oz Bottle) for use before, during or after makeup is applied. * Tropical Bronzer (1/4 oz Bottle) A radiant enhancer for eyes and cheeks to achieve that healthy radiant after sun glow. * Papaya Blush (1/4 oz Bottle) Perfectly pigmented to achieve a natural healthy-looking color that instantly brightens your complexion. Celebrating 50 Years of Beauty, Jerome Alexander introduces his latest addition to his popular MagicMinerals line of makeup with an innovative 3-piece AirBrush Foundation Kit. Achieve a silky smooth, professionally flawless foundation look that lasts all day. Jerome Alexander's ultralight mineral spray foundation provides you with the perfect base for glowing skin. Light enough for everyday use or buildable to give more coverage to easily conceal hard to cover areas and imperfections all without caking or a heavy makeup buildup. Jerome Alexander's multitasking formula is infused with the Jerome Alexander Skincare Makeup clinical level blend of skincare actives that provides a boost of intense hydration, reduces lines and wrinkles and brightens skin's appearance. Shake and spray the Misting Primer Spray onto the Kabuki Brush and apply to your face. The primer spray will help prep your skin for the foundation by hydrating, smoothing and plumping skins texture. Apply MagicMinerals Foundation onto your Kabuki brush, then blend and buff into cheeks, forehead and neck. You can control the amount of coverage you need simply by adding just a small amount of foundation for light coverage or by repeating the application process for more troubled skin. CLINICALLY FORMULATED TO DECREASE WRINKLES & BOOST COLLAGEN: Jerome Alexander MagicMinerals Skincare Makeup is made up of three skincare actives. Hyaluronic Acid, sometimes called the fountain of youth, adds and locks in a hydrating lubricant which helps prevent the effects of aging. Argireline, a protein made of three essential amino acids helps decrease the appearance of fine lines and wrinkles. Matrixyl 3000 relaxes wrinkles, boosts collagen production, and repairs the skin's elasticity. 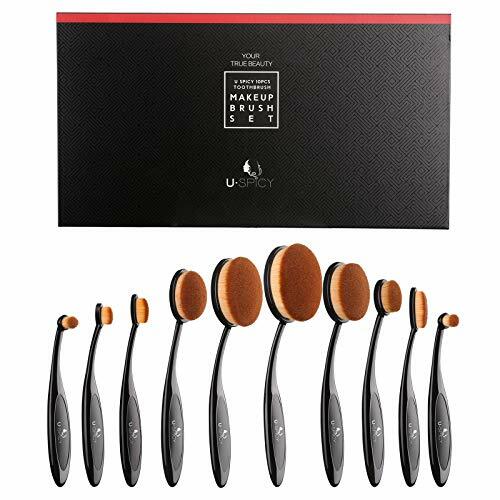 For the essential beauty experience, look no further than the USpicy Professional 10 Piece Makeup Brush Set. Following a familiar toothbrush-inspired design and with high quality synthetic hairs, each brush can expertly hold powder making it easier than ever to apply makeup and look your best. Thanks to their refined premium quality, the super soft, delicate, and dense synthetic bristles easily hold foundation, concealer, BB cream, powder, blush, etc. and help you evenly spread your makeup rather than having it all clumped together. Experience a whole different makeup with an ergonomically designed handle and soft grip that provide a stable means for getting ready without accidental smudges or congested application. Enjoy excellent quality all around with a set of professional makeup brushes that are delivered in an elegant packaging with a premium feel and look. The packaging is a nicely refined gift box in itself and provides a convenient way to safely store your brushes without risking of losing or damaging any. It's not just one brush but a set of ten different brushes each with a multiple functions to meet your beauty needs. Featured in the set are powder, concealer, contour, foundation, blending, eyebrows, and eyeliner brushes that are all expertly crafted to ensure long-term use. * Place brushes in warm water. * Apply a small amount of gentle shampoo to brushes and work into a light lather. * Rinse brushes thoroughly under running water. You will notice that the water leaving. the brush is tinted from protective coating. Single action trigger air control. Easy fluid refills and easy cleaning. Time : Designed for extended running and use. Suitable for 0.2~0.5mm airbrush ,especially perfect for makeup, cosmetic ,nail painting . There is no need for application by hand with sponges, brushes, fingers and other methods. The application process includes a stainless steel gun which is attached to a small air compressor. By pulling back on the trigger of the airbrush gun, the makeup is released and it flows through the hose which pushes the makeup through the needle-size opening of the gun onto the skin. The makeup comes out in a fine fan-shaped mist. Because of the fine misted spray, airbrush makeup provides a flawless coverage, evening out skin's imperfections and at the same time allowing your skin to breath. This results in a very natural, yet very polished look. Airbrush makeup is applied by putting several layers of makeup, which gives you the opportunity to make subtle changes which will lead to a flawless look. You spray the makeup at a distance of 6-12 inches, and for applying foundation use 6-12 drops of makeup. Don't forget this! The makeup will cling to dry patches, so it is very important that you moisturize your skin first. 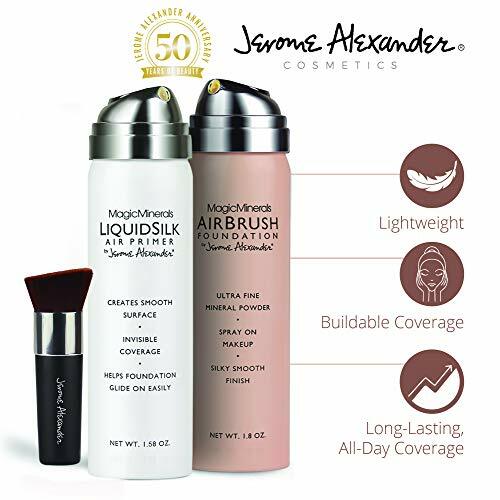 "Celebrating 50 Years of Beauty, Jerome Alexander introduces his latest addition to his popular MagicMinerals line of makeup with an innovative 2-piece AirBrush Foundation Kit. Achieve a silky smooth, professionally flawless foundation look that lasts all day. Jerome Alexander's ultralight mineral spray foundation provides you with the perfect base for glowing skin. Light enough for everyday use or buildable to give more coverage to easily conceal hard to cover areas and imperfections all without caking or a heavy makeup buildup. Jerome Alexander's multitasking formula is infused with the Jerome Alexander Skincare Makeup clinical level blend of skincare actives that provides a boost of intense hydration, reduces lines and wrinkles and brightens skin's appearance. Hyaluronic Acid: Adds and locks in hydration, which helps makeup look fresh all day long Argireline: Reduces fine lines and wrinkles Matrixyl 3000: Relaxes wrinkles and boosts collagen production, elasticity, and stimulates skin repair Our MagicMinerals AirBrush Foundation Kit and Apply Your Makeup Like A Pro Step 1: Quick and Easy Application - Apply MagicMinerals Foundation onto your Kabuki brush, then blend and buff into cheeks, forehead and neck. Step 2: Buildable Yet Breathable You can control the amount of coverage you need simply by adding just a small amount of foundation for light coverage or by repeating the application process for more troubled skin. AIRBRUSHED PRECISION: To celebrate Jerome Alexander's 50th Anniversary, we're featuring our brand new MagicMinerals AirBrush Foundation Kit - the same professional makeup technique used in Hollywood, on magazine covers, and fashion shows. 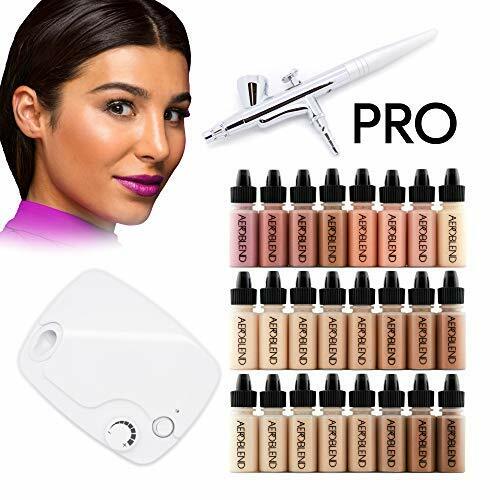 Apply your makeup like a Pro with silky smooth airbrushed precision - resulting in a flawless finish that looks professional any time of the day or night. You will be amazed at how great you look! CLINICAL LEVEL SKINCARE INGREDIENTS: Jerome Alexander MagicMinerals Skincare Makeup is made up of three skincare actives: Hyaluronic Acid - sometimes called the fountain of youth - adds and locks in a hydrating lubricant which helps prevent the effects of aging. Argireline - a protein made of three essential amino acids which decrease the appearance of fine lines and wrinkles. And Matrixyl 3000 - which relaxes wrinkles, boosts collagen production, and repairs the skin's elasticity. ULTRALIGHT MINERAL SPRAY FOUNDATION: Our innovative spray foundation provides full coverage in an ultra-light mineral formula. Light enough for everyday use or buildable to easily conceal hard to cover areas and neutralize imperfections all without caking or a heavy makeup buildup. The perfect start for glowing skin! FLAWLESS RESULTS IN NO TIME: Fast and easy to use, leaving you with flawless skin in less than five minutes. Simply shake and spray the foundation onto the Kabuki Brush and apply to fresh skin. Buff onto face, cheeks, and neck to blend. 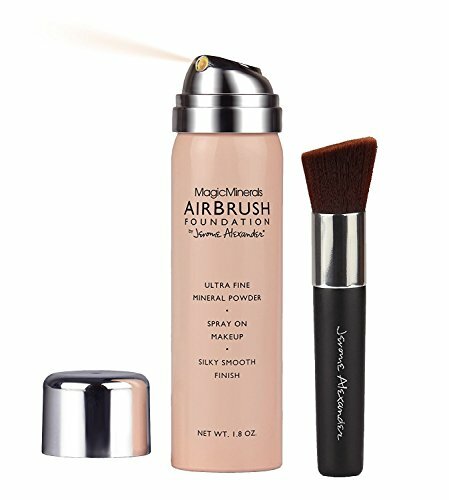 SUITABLE FOR ALL SKIN TYPES: MagicMinerals AirBrush Spray is the ideal rich mineral foundation solution for all skin types. Breathable and lightweight, our water and sweat resistant formula is available in our most popular medium light shade. 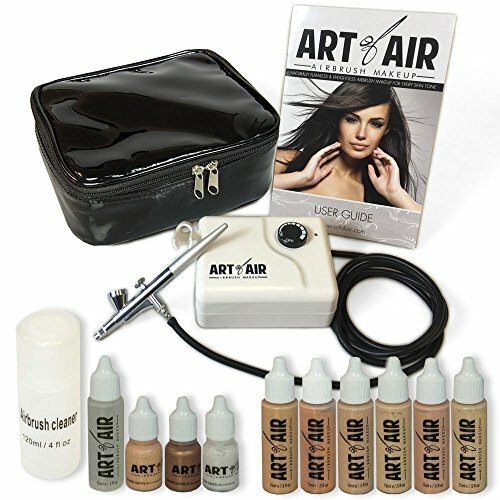 This amazing Spirit Air SP16 airbrush kit is ideal for Makeup, Manicure, Temporary Tattoo, Cake Decorating and other applications. 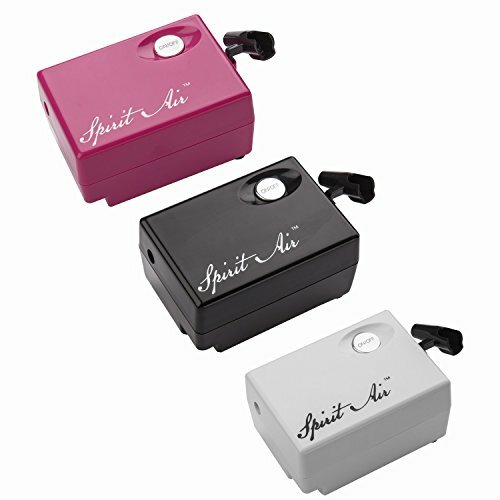 The Super Quiet Mini Airbrush Compressor with 3 levels of pressure adjustable Airflow Control Settings, Operates at 12V DC with a International converter 110V-240V AC plug in Adapter. Professional Precision Single-Action Gravity Feed Airbrush with a 0.4mm Tip & 1/15 oz Cup. Airbrush is designed to provide an ultra fine mist of makeup, allowing you to achieve a flawless, soft natural complexion. 1. This airbrush only for low dense degree of dye, and shall not be used for spraying thick paint. 3. After use, please clean the airbrush, avoid clogging, effect the next time you normally use. 4. To prolong your airbrush gun's life span, please clean your gun in a proper way:It will be better to clean with water thinner like Alcohol after water paint. oil paint should be cleaned with oil thinner like ethyl acetate.
. 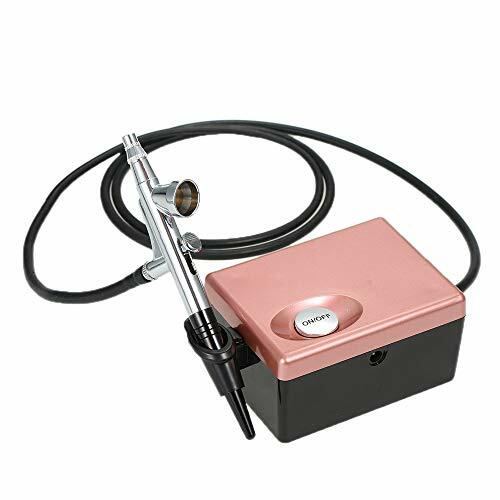 PRODUCT DETAILS: Professional Precision Single-Action Gravity Feed Airbrush, 3 levels of pressure adjustable Airflow Control Settings, 4.9 Feet Rubber Airbrush Hose, 0.4mm Tip & 1/15 oz Cup, 12V DC with 110V-240V AC plug in Adapter.
. PRECISION COMPONENTS: Enable the airbrush to work efficiently while providing exceptional atomization and accurate spray control.
. INTERNAL HOT PROTECTION DEVICE: The compressor will auto cut off the power when it's about to over heat, and reset after the motor cool down.
. QUIET & PORTABLE: Quiet and Durable mini compressor, Portable, lightweight and easy to carry around. Maintenance free, Oil-less, Easy fluid refills and Easy Cleaning.
. MULTIPURPOSE: Excellent Airbrush Kit for both professional and personal use. 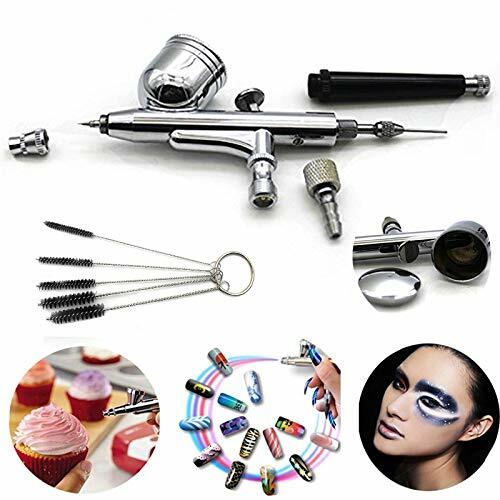 Ideal for Airbrush Makeup, Temporary Tattoos, Nail Art, Face Paint, Tanning, Cake decoration and Crafts. Suitable with most Brand water base airbrush foundation. UNIMEIX Won't Let You Down! more than 2 or 3 eyeshadow at a time? and a nice blending brush. right amount of formula for an ultra-polished "HD" finish. recommend this valuable 15pcs set to new begginners. the water leaving the brush is tinted from old makeup. 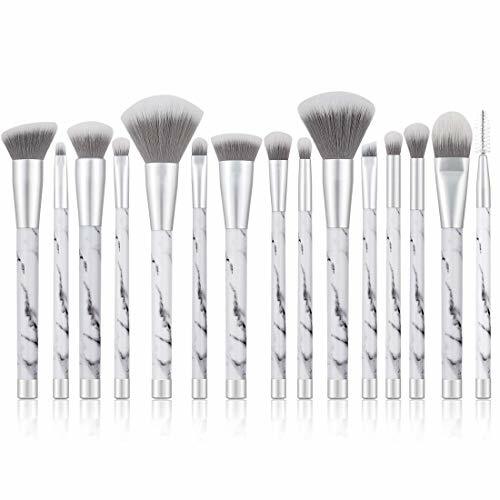 marble makeup brush Sturdy, yet light, the Marble Look handles are made with a comfortable design for seemingly effortless movements. 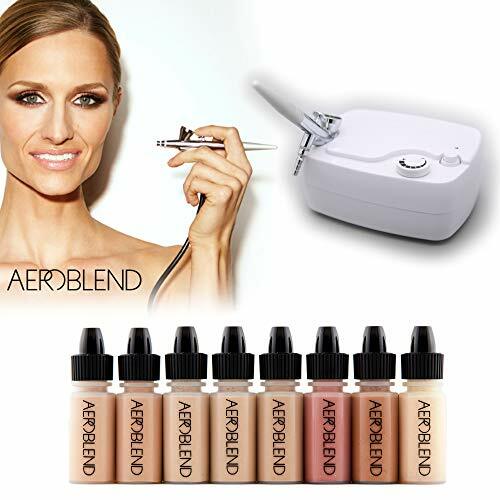 This is a Basic Airbrush Makeup Kit from OPHIR. OPHIR has been concentrating on Airbrushing for many years. allowing you to achieve a flawless, soft natural complexion. You will love it very much! The Basic Airbrush Makeup Kit for Beginners. 4 Colors of Airbrush Foundation which allow you to achieve a flawless, soft natural complexion. Light Pink, Brown and Pearl White can be used as Blush, Eyebrow, Eyeshadow. OPHIR was established in USA and we've been Concentrating on Airbrushing for Many Years. FULL 1-YEAR WARRANTY: The OPHIR air compressor and airbrush are built to last -designed to be used daily whether for personal or professional use If anything goes wrong within the first year, let us know and we'll make it right. (1) *Airbrush Cleaning: 1 Place the cup clean. 2.Then put the diluent and then spray a few times, until the discharged liquid is not color. 3.The hand block vents, then spray the cup at reflux bubbles. 4.Remove the needle, wipe. 5. The whole water and then installed. *Q: Airbrush only have air comes out ,does not spray water. Solution: 1.Rotate the tail handle and remove it. 2.Stretch this metal tube,pull out and push in gently,repeat it a few times. 3.loosen the needle chucking net,then pull out the needle and push in back,and repeat it a few times. 4.Reassemble the airbrush. 1) Airbrush with 7cc Gravity Feed cup and 0.3mm nozzle, Length: 15.5cm(6.1in), Weight: about 150g, Working Pressure is 15-50 PSI ,Metal Alloys,100% Brand New. 2) Pasting position: Auto graphics, Cake Decorating, Make up, Temporary Tattoos, Crafts and Hobbies. 3) Made of High-quality precision parts, Working efficiently while providing excellent atomization and precise spray control. 4) Multi-Purpose High Performance Airbrush.Precision-crafted body,Designed for greater comfort during prolonged detail finishing sessions. 5) Suit for beginners and students, as well as for advanced artists since it works excellent for most airbrushing applications and also with most types of paint spray media. Easy to fluid refills and purifying. 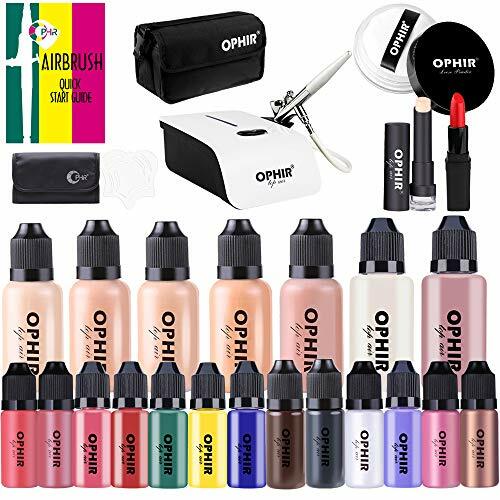 This is a professional Upgraded Airbrush Makeup Kit from OPHIR. 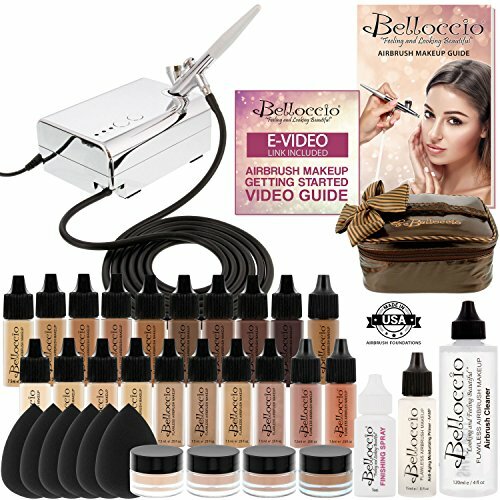 This Makeup Kit adds more colors of foundations,which will make your makeup work more amazing! 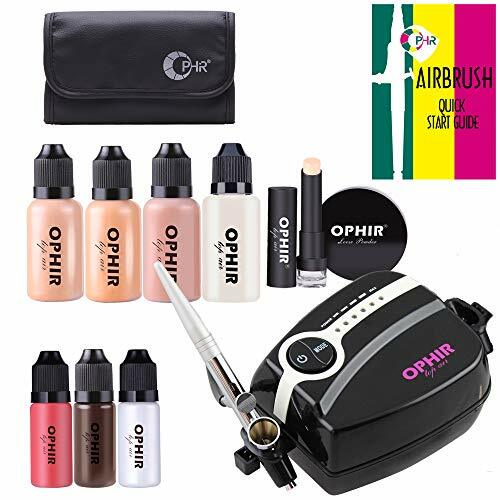 This is a Professional Airbrush Makeup Kit from OPHIR. 7 Colors of Air Foundation and 13 Colors of Blush, Eyeshadow, Eyebrow, Lip Pigment help you make any styles come true. 1>Fill the cup with desired fluid. 2>Hold the gun lightly in your hand. 3>By pushing down on the trigger the air valve is opened. 4>Pulling back on the trigger allows material from the cup to flow. 5>The trigger is pushed and pulled at the same time to operate. Push the trigger forward and remove finger from trigger. The spray pattern is in accordance with the distance between a work surface and the airbrush gun nozzle. 1>The oxygen gun should be cleaned after every use to avoid clogging. 2>Fill the airbrush cup 1/4 full with an O2 cleaner or solvent used for airbrush guns (not included), and spray directly into gauze or towel letting the tip of the gun touch the gauze or towel, spray until empty. 3>Then fill the cup 1/4 full with water and spray until empty. It features matte effect, oil control, makeup keeping. It can reamain watery for a long time. You can make up at any time with it to increase skin moisture and reduce powder marks. It can maintain the makeup for a more lasting time. *Using*:1. Fill fluid in the cup after thinning appropriately. 2. Hold the airbrush lightly in you hand. 3. By pressing the main lever,a stream of air emerges.Then draw it backward gradually for Color atomization. 4. The spray pattern is in accordance with the distance between a work surface and a air brush. 5. For fine line spray,remove the needle cover and hold the air brush near a work surface. 2 *Cleaning: 1. Place the cup clean. 2. Then put the diluent and then spray a few times, until the discharged liquid is not color. 3. The hand block vents, then spray the cup at reflux bubbles. 4. Remove the needle, wipe. 5. The whole water and then installed. When using it for the first time, please adjust the spray gun to the best condition, then use clean water for testing, and ensure the atomization state is normal before use. After use, clean the gun to avoid clogging. 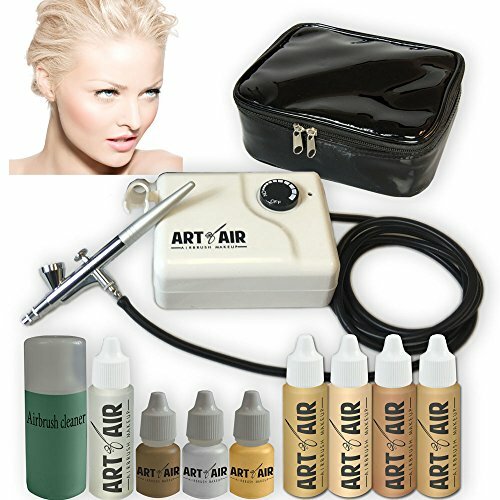 1) Airbrush Kit: Multi-Purpose High Performance Airbrush, Double-action Trigger Air-paint Control Airbrush. Standard Nozzle Dia. : 0.2mm nozzle: Airbrush on 0.2, parts 0.3 and 0.5. Cup Capacity: 9cc. Working Pressure:15-50psi, Size:16cm*2.8cm, N.W./G.W.:277g/349g. 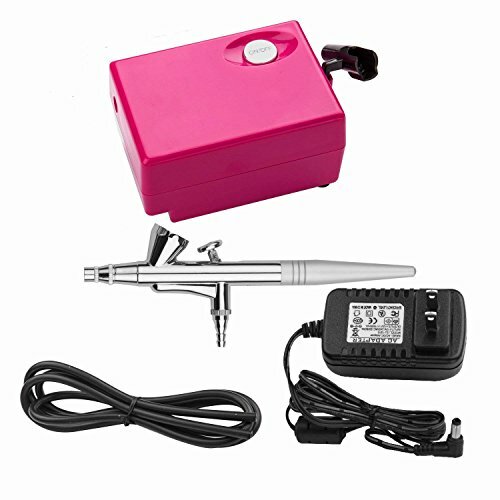 2) Double-action Technology: Perfect for Airbrush, Nail Art Design, Art Painting (car, bicycle, bike, etc. ), Airbrush Tattoos, Makeup Body painting, Cake decoration and More. Color Media like Water paint, oil paint,Watercolors,Enamels,Acrylics Inks & Dyes,Lacquers all can be for use on. 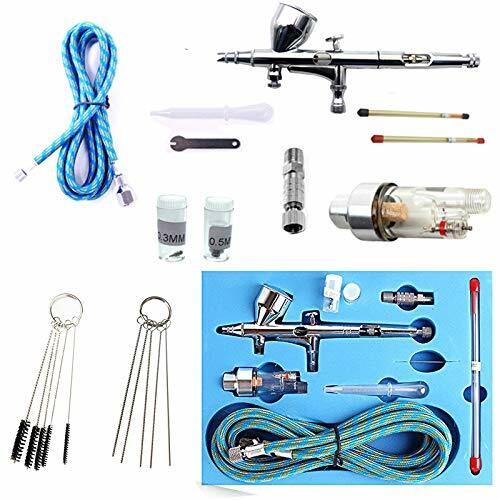 3) Various Needle Sizes: The gun comes with a set of 0.2 mm/0.3 mm/0.5 mm needles, even the gun hose.Double-action Trigger and the Rear adjustable locknut allows users to control the quantity of air and fluid released exactly, You can use different needles to make all kinds of fine mists you want. 4) Maintenance: Empty the fluid cup and wash with water or solvent by a brush. Refill cup with water or solvent,then block the needle cover with a finger and spray. The air flows backward into nozzle to clean the paints remained the air brush. 5) Package include:1 x Airbrush,1 x Nozzle Wrench,1 x Eye Dropper,1 x Instruction,1 x 0.3mm nozzle,1 x 0.5mm nozzle,1 x 0.5mm nezzle cap, 1 x 0.3mm jet needle, 1 x 0.5mm jet needle, 1 x Fast joint, 1 x Oil / water separator, 1 x Air hose, 2 x Air Brush Cleaning Repair Tools.